Audio description is an accessibility format often used in theaters, museums, educational programs, and publishing companies as well as other businesses. Text-to-Speech (TTS) Audio: We use our proprietary script and state-of-the-art synthesized voice technology to create audio documents. This is a cost-effective method to create audio documents. Final audio documents are delivered as an Audio CD, MP3, or on a flash drive. 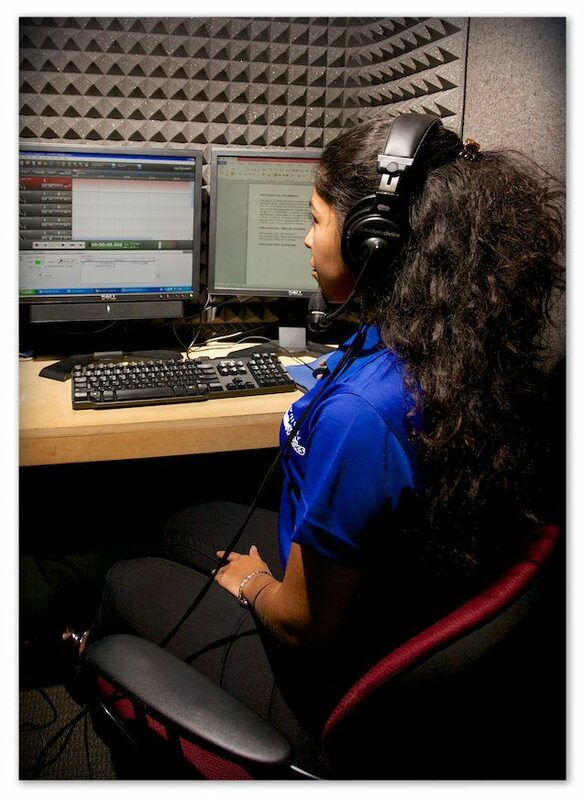 Live Reader: With our live reader option, we have a voice-over professional read the proprietary script, and record the document in our production studio. Completed audio documents can be delivered as an Audio CD, MP3, or on a flash drive. Audio scripting is more than reading. At Braille Works, our experience tells us that audio documents should be properly formatted and scripted to recreate the intent of the visual document. For all audio transcriptions, we use a proprietary scripting process that assembles your documents into logical segments. Now your customers will have audio documents that are easy to navigate and understand. Virtually any document can be converted to audio. Whether your company needs a single audio document, or multiple audio documents, Braille Works is the partner you’ve been looking for. Virtually any document can be converted to audio. Whether your company needs a single audio document, or multiple audio documents, Braille Works is the partner you’ve been looking for. Our Live Reader service is available in English and Spanish. Translation services are not provided, all documents are converted as provided. We also provide a service for converting documents to a “screen reader friendly” format. This process gives your customers with blindness or low vision an accessible document (Section 508 compliant) they can listen to independently using their PC.